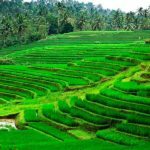 Busungbiu Rice Terrace is one of the tourist destinations in North Bali that offers the stunning panoramic view of the rice terrace. This stretch of rice fields looks very stunning with a background by green hills and in the middle of the rice field visible strands of a shimmering river with flowing water throughout the year. 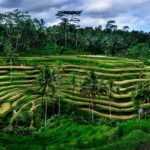 Busungbiu Rice Terraces is an exquisitely beautiful rice terrace set in the deep valley offering an amazing panoramic view of rice terrace and natures surround it. 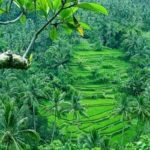 It is situated in the tranquility of Kekeran village, Busungbiu district, Buleleng Regency, Singaraja Bali. 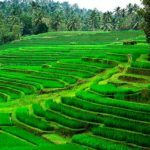 Busungbiu Rice Terraces is secluded rice field with pure natures surround it including green hills. The amazing panorama can be viewed from the top of the hill opposite to the long green view to the sea. It is strategically set beside of the main road from Pupuan to Singaraja or just about 30 kilometers south of Singaraja Town. The atmosphere of Busungbiu Rice Terrace is very quiet and calm, far from the city and crowds as well as pollutions, offers a peaceful ambiance. There are gazebos provided for visitors, it is very comfortable for relaxing and having a picnic. For visitors who like trekking, it is recommended to have a trek in this beautiful rice field. Visitors would see a clear fresh river flowing as the irrigation and also have a chance to see the farmers’ activities from a close distance. It is a great place to have a rest after a long journey from Denpasar, or on the way back from Lovina Beach. Rice Paddies trekking to explore the beautiful rice field is one of the activities can be done at Busungbiu Rice Terrace. 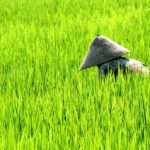 You can discover the pure natures of rice fields, beautiful river and meet farmers working in the rice field. You will understand about Subak Irrigation System executed at this site. When visiting Singaraja and passing through Pupuan District then you will have the opportunity to visit this site since it just located beside the main road. From the top of the hill, you can see the amazing panoramic view of rice terrace Kekeran rainforest and green hills surround it.